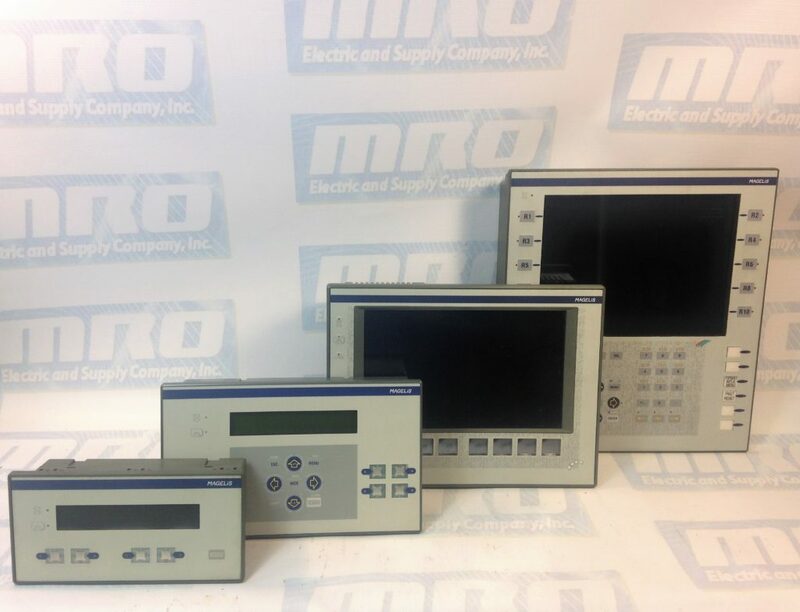 MRO Electric and Supply has new and refurbished Schneider Electric and Modicon parts available now, and also offers repair pricing. For more information, please call 800-691-8511 or email sales@mroelectric.com. Need a replacement TSXCUSBMBP? Request a Price Quote Now. 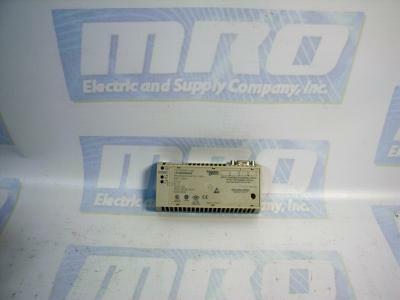 The Schneider Electric TSXCUSBMBP is a USB Modbus Plus Communications Adapter. In this guide, we will show you how to install the hardware, configure the driver software, and use the Modbus Plus network diagnostics features of the driver software. Important: The least versions of the TSXCUSBMBP driver to run on Win Server 2012 R2 are driver versions 8.0 and 8.1. The TSXCUSBMBP is designed to bridge the gap between a USB connection and the Modbus Plus network. It combines hardware and software together in one simple and single device. 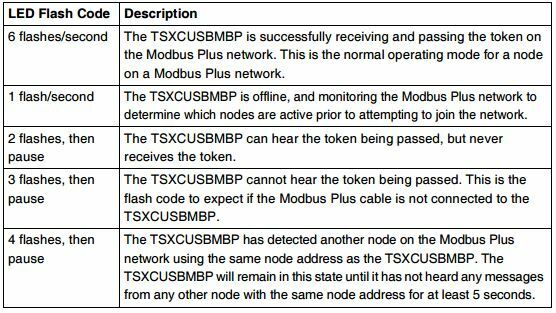 The module has its own Modbus Plus node address which can be set through the TSXCUSBMBP driver software. This module allows software applications using the serial Modbus RTU communications to connect on the high-speed Modbus Plus network, as well as provide diagnostic capabilities to the Modbus Plus network. Most Win32 Applications that support serial Mdubus communications can use a Modicon TSXCUSBMBP to connect on a Modbus Plus network. A VSP (Virtual Serial Port) is what redirects communications from Concept, Unity, ProWorx32 and other programs to the TSXCUSBMBP communications adapter. After the VSP is installed, it will create one serial port with the port reference as defined in the module’s driver software. When configuring the Modbus application software, this port reference is selected as the serial port for the application to use. The routing table is used to associate Modbus Slave IDs with 5-byte Modbus Plus routing paths which allow the application software to communicate with any Modbus Plus device within range on the network. 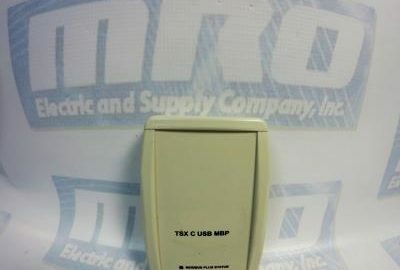 The TSXCUSBMBP’s hardware consists of a box with a USB cable from one end (which connects to the PC) and a standard Modbus Plus DB9 connector on the other end (for the Modbus Plus network). Local signalling LEDs on the top cover of the device tell you the presence of power from the USB port and the state of the Modbus Plus network – no external power supply is required. – Windows XP Operating System with service pack 2, or Windows 2000 with Service Pack 4 or greater. – 1 MB of free disk space. – Minimum of 256 MB of RAM. – One free USB port or a USB Hub that supports USB 1.1 or greater. If a previous version of the TSXCUSBMBP was installed, the VSP component of the driver must be manually uninstalled using Device Manager before a new version can be installed. After this, the new driver should be installed before connecting the new TSXCUSBMBP to the PC. After the new driver is installed, connect the TSXCUSBMBP and install using the New Hardware Wizard. After completing the instructions, you should see a message stating “Your new hardware is ready to use.” Restart your computer, and the device should be fully functional. If the driver starts up before the TSXCUSBMBP is connected, then it will be necessary to re-scan for adapters so the driver can detect it. The communications adapter must be assigned a Modbus Plus node address to communicate on the network. Select “Settings” and then type the address in the appropriate box. When complete, hit “Save”. The slave response timeout is used by the module each time it sends a request from an application out on the network to a slave device. Use the manual to determine the appropriate value that should be used with your system. Select “Settings” and then type the value in the appropriate box. When complete, hit “Save”. To do this, select “Virtual Modbus Port.” Select the desired COM port from the list available. When complete, click “Save”. If you experience any problems while configuring your adapter, please use the table below to determine the appropriate error code given by the LEDs, if applicable. As always, refer to the user manual for more complete information. 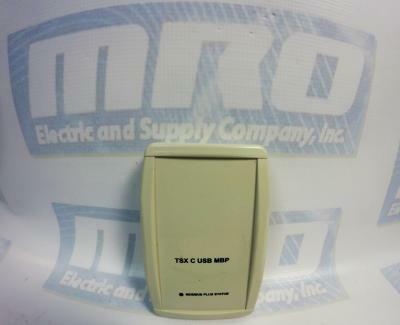 MRO Electric carries both New and Refurbished TSXCUSBMBP Communication Adapters. For more information on this module or to request a price quote, please call 800-691-8511 or email sales@mroelectric.com. The XBTGT5330 is a Magelis XBTGT Advanced Touchscreen Panel with a back-lit color LCD display and Thin Film Transistors screen technology. It has a 10.4 inch display that is 640 by 480 pixels VGA. It has a Magelis operating system and uses Vijeo Designer software. The XBTGT5330 also has a CPU RISC processor with a frequency of 266 MHz. The XBTGT5330 has a back-light lifespan of 54,000 hours. If your panel has seen more use, it may be time to replace it. If you are seeing orange on the local LED, then the panel’s back-lighting is faulty. The entire panel is touch sensitive. Additionally, there are 8 levels of brightness and contrast on the touch panel. 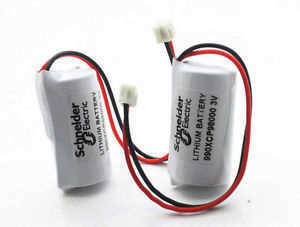 It uses a 24V DC power supply, which should be kept in between 19.2 and 28.8 volts. The inrush current should be kept to less than 30 amps, and the panel’s power consumption is less than 50 watts. The allowable voltage drop is <10ms. The XBTGT5330’s dimensions are approximately 270.5 x 212.5 x 212.5 mm. The product itself weighs 2.5 kg. The minimum number of fasteners to install the panel is 4, with a maximum of 10. It is strongly recommended that an installation gasket is used, since it absorbs vibration and also repels water. Why is the status LED on my XBT-G Magelis unit orange? The status LED on the XBT-G Magelis units will illuminate orange to indicate the backlight has burned out. The unit will need to have its backlight replaced. What is the replacement for the Magelis XBTGT5330 HMI? —Screen resolution limited to VGA. —Better Screen color TFT LED 65K , More Flash Memory , addition mini-USB Device port and use of SD card slot. —VijeoDesigner applications are 100 % compatible. —Better Screen color TFT LED 16M and more resolution , More Flash Memory , addition mini-USB Device + Host/Device front USB ports and use of SD card slot. What is the cable needed to connect the M340 to the XBTGT5330 terminals? The cable combination that is needed is the XBTZ938 + XBTZG909. It will connect the M340 and the HMI. What are the cables needed to connect the XBTGT5330 terminals to the Premium, Micro and Twido PLCs? The following table lists the cables that can be used with the Premium, TSX Micro, TSX Nano and Twido PLCs that have the round mini DIN connector. 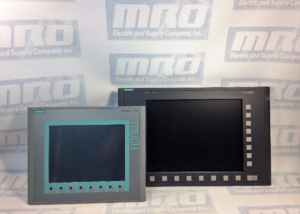 What Magelis HMIs did the XBTGT5330 replace? Can I enable Vijeo Designer Web Gate from the Magelis XBTGT5330 screen? No, you can not enable Web Gate from the Magelis screens. Web Gate has to be enabled and setup from the Vijeo Designer development software. What is the part number of the cable used for connecting a Magelis XBTGT5330 terminal to a TSX Micro PLC? 2. If using COM PORT 2 ( RJ45) on the Magelis to connect to the TSX Micro use XBTZ9780. Can the Magelis XBTGT5330 access the timer preset value (Time data type) in the Modicon PLC directly? Keep in mind that the value of the integer or DINT is in milliseconds where the Time value could be in any format. Why don’t my new passwords work in my XBTGT5330? After a change is made to any security data (passwords or user names and groups) all runtime data must be deleted before the security change will take effect. During the download of the updated application, a window pops up and the “Delete all runtime data” check box must be selected.